The three variations of Liftoglobin. 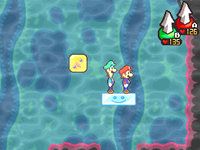 Liftoglobins are rectangular Emoglobins found only in Mario & Luigi: Bowser's Inside Story. While thawed, they are just yellow rectangles that have no use for Mario & Luigi. However, when Bowser inhales some of Blizzard Midbus' chilly breath, they turn solid, and their faces become frowns. Whenever both of the Mario Bros. step on a Liftoglobin, their frown is turned into a smile. This allows the player to slide the Liftoglobin in any direction they want with a flick of the stylus. These Emoglobins can lift the Bros. to higher places they could not reach before. If one or both of the Mario Bros. fall off the Liftoglobin, then it will stop moving, and its face will return to a frown. If the Emoglobin is off-screen without the Mario Bros., then it will return to its original position. Also, if Bowser steps away from the chilly air, then the Liftogoblin will thaw back to its yellow color, and be stuck in the position in which it last was. Liftoglobins only appear in the Airway. Spanish (NOE) Elevoglobina From elevar (to lift) and globina (globin). French Ascensobing From ascenseur (lift). This is the only type of Emoglobin that is never shown talking. This page was last edited on March 27, 2019, at 16:05.